Knee Power primarily works on the vertical up and down aspect of power and although you are bending your knees it is about the use of your legs for power. That power can be utilized in your horizontal movement and added to your waist power. When first learning and working on Knee power isolate any tests and drills so that you just work on your knees and legs while not using any waist motion so that you can see what your knees (legs) will do without confusing the issue. In this training you really want to gain a visceral understanding of how it feels and what you need to do to really use your legs for power. In waist power you are mostly working on the horizontal movement. In knee power (leg power) you are working on vertical up and down movement. When you add the two together you are working on being able to express more power in all directions. Here are a couple of knee power (leg power) tests and exercises. 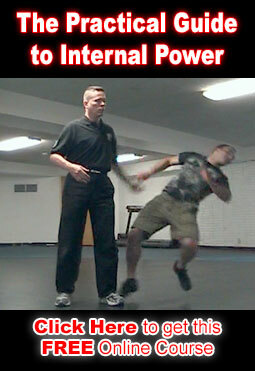 Try pushing a resisting partner or heavy object without using knee power and then push against the same resisting partner or heavy object while using knee power. There should be a noticeable difference. Also, try throwing a punch in the air without using knee power and then do the same punch using knee power by squatting half way and then bouncing upwards as you throw the punch and dropping back to where you started without delay. Essentially do it as a bouncing action. Then do the punch again without using knee power to get a good comparison between the two things. Another good comparison exercise for knee power is to have a strong partner grab you. Try to pull your partner without using knee power and then try to pull them using your knees / legs for power. Also, try to escape by pulling your arm away without using knee / leg power then do the same thing again but primarily using your knees / legs as the source for power.